- Total 11,544,951 (2011 est). Ohio is a Midwestern state of the United States of America. Part of the Great Lakes region, Ohio has long been a cultural and geographical crossroads. At the time of European contact and in the years which followed, Native Americans in present day Ohio include the Iroquois, Miamis, and Wyandots. Beginning in the 1700s, the area was settled by people from New England, the Middle States, Appalachia, and the upper south. Prior to 1984, the United States Census Bureau considered Ohio part of the North Central Region. That region was renamed "Midwest" and split into two divisions. Ohio is now in the East North Central States division. 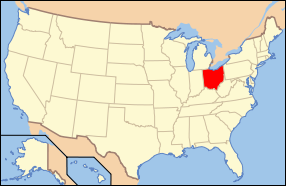 Ohio is one of the smallest states west of the Appalachian Mountains. However, it ranks near the top in population, making it the ninth densest state in the nation. 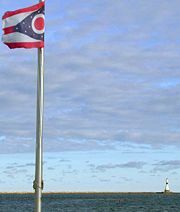 Ohio was the first state admitted to the Union under the Northwest Ordinance. It takes its name from the Seneca nation word for its major river (the Ohio), meaning beautiful river. The name Ohio is an Iroquoian Indian word. It is from the Seneca nation who inhabited the area before westward expansion of Europeans. "Ohiyo" was the Seneca name used for both the Ohio, which forms the state's southern border, and Allegheny Rivers, and meant beautiful river. Ohio's geographic location has proved to be an asset for economic growth and expansion. Because Ohio links the Northeast to the Midwest, much cargo and business traffic passes through its borders on its well-developed highway system. Ohio has the nation's tenth largest highway network, and is within a one-day drive of 50 percent of North America's population and 70 percent of North America's manufacturing capacity. To the north, Lake Erie gives Ohio 312 miles (502 km) of coastline, which allows for numerous ports. Ohio's borders were defined by metes and bounds in the Enabling Act of 1802. Ohio is bounded by the Ohio River, but the river itself belongs mostly to Kentucky and West Virginia. The finalized border with Michigan changed, as a result of the Toledo War, to angle slightly northeast to the north shore of the mouth of the Maumee River. Ohio's southern border is thus defined by the Ohio River (with the border being at the 1793 low-water mark on the north side of the river), with much of its northern border defined by Lake Erie. Ohio's neighbors are Pennsylvania to the east, Michigan to the northwest, Ontario, Canada, to the north, Indiana to the west, Kentucky to the south, and West Virginia to the southeast. Much of Ohio features glaciated plains, with an exceptionally flat area in the northwest known as the Great Black Swamp. 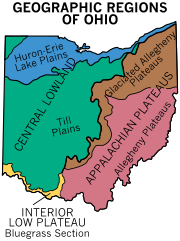 This glaciated region in the northwest and central state is bordered to the east and southeast first by a belt known as the glaciated Allegheny Plateau, and then by another belt known as the unglaciated Allegheny Plateau. Most of Ohio is of low relief, but the unglaciated Allegheny Plateau features rugged hills and forests. Significant rivers within the state include the Cuyahoga River, Great Miami River, Maumee River, Muskingum River, and Scioto River. The rivers in the northern part of the state drain into the northern Atlantic Ocean via Lake Erie and the Saint Lawrence River, and the rivers in the southern part of the state drain into the Gulf of Mexico via the Ohio and then the Mississippi rivers. The worst weather disaster in Ohio history occurred along the Great Miami River in 1913. Known as the Great Dayton Flood, the entire Miami River watershed flooded, including the downtown business district of Dayton. As a result, the Miami Conservancy District was created as the first major flood plain engineering project in Ohio and in the United States. Grand Lake St. Marys in the west central part of the state was constructed as a supply of water for canals in the canal-building era of 1820–1850. For many years this body of water, over 20 square miles (52 km²), was the largest artificial lake in the world. Ohio's canal-building projects promoted economic development; some cities, like Dayton, owe their industrial emergence to location on canals. As late as 1910, interior canals carried much of the bulk freight of the state. Ohio farm in the early morning mist. The climate of Ohio is a humid continental climate throughout most of the state except the extreme southern counties of Ohio's Bluegrass region section that are located on the northern periphery of the humid subtropical climate and Upland South region of the United States. Summers are hot and humid throughout the state, while winters are generally cool to cold. Temperature ranges, north to south in the state, from 80 to 86° F (27 to 30° C) and 25 to 39° F (4 to -1° C). Precipitation is moderate year-round, around 32 to 42 inches (810 to 1070 mm). Severe weather is not uncommon in the state as it is a battleground between cold Arctic air and warm Gulf air for much of the year, although there are fewer tornadoes in Ohio than in states to the west. Severe lake effect snowstorms are also not uncommon along the southeast shore of Lake Erie, which also provides a moderating effect on the climate there. Although predominantly not in a subtropical climate, some warmer-climate flora and fauna does reach well into Ohio. Evidencing this climatic transition from a subtropical to continental climate, several plants such as the Southern magnolia, Albizia julibrissin(mimosa), Crape Myrtle, and even the occasional Needle Palm are hardy landscape materials regularly used as street, yard, and garden plantings in the Bluegrass region of Ohio; these same plants do not thrive in much of the rest of the State. The history of human habitation in the area that eventually became Ohio can be traced back more than 10,000 years from evidence of flint tools known as Clovis points. The first evidence of farming cultures, the Woodland culture, dates back 2,000 to 3,000 years. The Hopewell culture was characterized by small agricultural villages grouped around major ceremonial sites like the Newark Earthworks, believed to be two thousand year old burial mounds. Later groups left evidence of changing village cultures, and the spread of agriculture. Tecumseh, great leader of the Shawnee tribe in the early 1800s. Much of the region was claimed in the 1600s by invaders from the powerful Iroquois confederation. After depleting the fur-bearing animals, particularly beaver, in their territory, the Iroquois sought to expand their control of more lands to sustain their lucrative fur trade with the European explorers and traders. This era was known as the Beaver Wars and, along with epidemics, resulted in the emptying of the Ohio region of its indigenous people by the mid-to-late seventeenth century. The land gradually became repopulated by the mostly Algonquian-speaking descendants of its ancient inhabitants, that is, descendants of the Adena, Hopewell, and Mississippian cultures. Many of these Ohio-country nations were multi-ethnic and sometimes multi-linguistic societies emerging from the earlier devastation brought about by disease and subsequent social instability. They subsisted on agriculture (corn, sunflowers, beans, etc.) supplemented by seasonal hunts. By the 1650s they were part of a larger global economy brought about by fur trade. During the eighteenth century, France set up a system of trading posts to control the fur trade in the region. In 1754, France and Great Britain fought a war known in the United States as the French and Indian War. As a result of the Treaty of Paris, the French ceded control of Ohio and the rest of the Old Northwest to Great Britain. Pontiac's Rebellion in the 1760s challenged British military control, which ended with the American victory in the American Revolution. In the Treaty of Paris in 1783 Britain ceded all claims to Ohio to the United States. The United States created the Northwest Territory under the Northwest Ordinance of 1787. Slavery was not permitted. Settlement began with the founding of Marietta by the Ohio Company of Associates, which had been formed by a group of American Revolutionary War veterans. Following the Ohio Company, the Miami Company (also referred to as the "Symmes Purchase") claimed the southwestern section and the Connecticut Land Company surveyed and settled the Connecticut Western Reserve in present-day Northeast Ohio. The old Northwest Territory originally included areas that had previously been known as Ohio Country and Illinois Country. As Ohio prepared for statehood, Indiana Territory was created, reducing the Northwest Territory to approximately the size of present-day Ohio plus the eastern half of the Lower Peninsula of Michigan and the eastern tip of the Upper Peninsula. Under the Northwest Ordinance, states to be formed out of the Northwest Territory would be granted statehood when the population exceeded 60,000. Although Ohio's population numbered only 45,000 in December 1801, Congress determined that the population was growing rapidly and would exceed 60,000 by the time it became a state. On February 19, 1803, President Jefferson signed an act of Congress approving Ohio's boundaries and constitution. However, Congress never passed a resolution formally admitting Ohio as the seventeenth state. The current custom of Congress declaring an official date of statehood did not begin until 1812, with Louisiana's admission as the eighteenth state. When the oversight was discovered in 1953, Ohio's Rep. George H. Bender introduced a bill in Congress to admit Ohio to the Union retroactive to March 1, 1803. At a special session at the old state capital in Chillicothe, the Ohio state legislature approved a new petition for statehood that was delivered to Washington, DC on horseback. On August 7, 1953, (the year of Ohio's 150th anniversary), President Eisenhower signed an act officially declaring Ohio's admittance into the Union. State motto: "With God all things are possible." Unofficial Motto 1: "The heart of it all!" Used on Ohio's license plates and welcome signs between the years 1991 and 2001. Unofficial Motto 2: "So much to discover." Adopted as part of state bicentennial campaign. Also used on welcome signs since 2001. Unofficial Motto 3: "Birthplace Of Aviation" Used on Ohio license plates and welcome signs since 2001. It also appears in Ohio's design for the 50 State Quarters program. Eight U.S. presidents hailed from Ohio at the time of their elections, giving rise to the nickname "Mother of Presidents," a distinction it shares with Virginia. Seven presidents were born in Ohio, making it second to Virginia's eight, but Virginia-born William Henry Harrison and his grandson, Benjamin Harrison, (who also lived part of his adult life in Indiana) settled in, led their political careers from, and/or were buried in North Bend, Ohio on the family compound, founded by William's father-in-law, John Cleves Symmes. In 1835, Ohio fought a mostly bloodless boundary war with Michigan over the Toledo Strip known as the Toledo War. Congress intervened and, as a condition for admittance as a state of the Union, Michigan was forced to accept the western two-thirds of the Upper Peninsula, in addition to the eastern third that was already part of the state, in exchange for giving up its claim to the Toledo Strip. Ohio's central position and its rapidly growing population gave it an important place during the Civil War. The Ohio River, the border between Ohio and West Virginia, was a vital artery for troop and supply movements, as were Ohio's railroads. By the end of the Civil War, three leading Union generals were from Ohio: Grant, Sherman, and Sheridan. Ohio also contributed more soldiers per-capita than any other state in the Union. In 1912 a Constitutional Convention was held with Charles B. Galbreath as Secretary. The result reflected the concerns of the Progressive Era. It introduced the initiative and the referendum, allowed the General Assembly to put questions on the ballot for the people to ratify laws and constitutional amendments originating in the Legislature as well. Under the Jeffersonian principle that laws should be reviewed once a generation, the constitution provided for a recurring question to appear on Ohio's general election ballots every 20 years. The question asks whether a new convention is required. Although the question has appeared in 1932, 1952, 1972, and 1992, it has never been approved. Instead constitutional amendments have been proposed by petition to the legislature hundreds of times and adopted in a majority of cases. During and following the civil war, Ohio built up their industrial structure, particularly in the northeast section of the state and around Lake Erie. By the turn of the century manufacturing brought in twice as much income as agriculture. In the large metropolitan areas, such as Toledo and Cleveland, problems arose typical to industrialization. In the 1960s racial problems were rampant throughout the U.S., especially in cities with large African-American populations. This was no less true in Ohio. A number of lives were lost in Cleveland riots during that period. In 1968 Carl B. Stokes became Cleveland's mayor, and was the first black mayor of any large U.S. city. During the Vietnam War, anti-war protests throughout America in the 1970s also hit Ohio, particularly Kent State University near Akron. In May 1970 four students were killed by national guardsmen, and nine others were wounded. The protests sprang up in response to President Nixon's announcement on April 30 of U.S. troop entrance into Cambodia. There was a significant national response to the shootings: hundreds of universities, colleges, high schools, and even middle schools closed throughout the country due to a student strike of eight million students, and the event further divided the country along political lines. 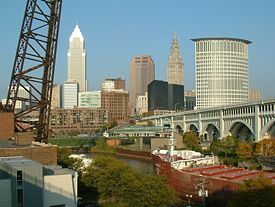 Since the 1970s Ohio has shifted from a manufacturing economy toward a service-oriented economy due to severe economic problems, especially Cleveland's default on that city's debts. The state government is headed by a term-limited Governor, elected to a four year term. Other officers include: Lieutenant Governor, Secretary of State, Attorney General, Auditor, and Treasurer. The legislative branch of the state government, the Ohio General Assembly, is made up of the House of Representatives with 99 Representatives, term-limited to four successive two-year terms, and the Senate, with 33 term-limited members. The State Supreme Court has seven Justices, elected to a six-year term. The positions are not term-limited, but are age dependent; Justices serve until 70 years of age. In the United States federal government, Ohio is represented by two US Senators and has 18 seats in the United States House of Representatives. Ohio's demographics cause many to consider the state as a microcosm of the nation as a whole. A Republican presidential candidate has never won the White House without winning Ohio, and Ohio has gone to the winner of the election in all but two contests since 1892, backing only losers Thomas E. Dewey in 1944 (Ohio's John Bricker was his running mate) and Richard M. Nixon in 1960. Consequently, the state is very important to the campaigns of both major parties. The mix of urban and rural areas, and the presence of both large blue-collar industries and significant white-collar commercial districts leads to a shifting balance of conservative and liberal population that (and the state's 20 electoral votes, more than most swing states) makes the state very important to the outcome of national elections. The state supported Democrat Bill Clinton in 1992 and 1996, but supported Republican George W. Bush in 2000 and 2004. Ohio was a deciding state in the 2004 presidential election between George W. Bush and John Kerry. Bush narrowly won the state's 20 electoral votes by a margin of two percentage points and 50.8 percent of the vote. Ohio was also a deciding factor in the 1948 presidential election when Democrat Harry S. Truman defeated Republican Thomas Dewey (who had won the state four years earlier) and in the 1976 presidential election when Democrat Jimmy Carter defeated Republican Gerald Ford by a slim margin in Ohio and took the election. The most solidly Democratic areas of the state are in the northeast, including Cleveland, Youngstown, Lorain/Elyria, and other industrial areas. Specifically, the core of this region includes eight counties stretching east along Lake Erie from Erie County to the Pennsylvania border and south to Mahoning County. Southwestern Ohio, especially the suburbs of Cincinnati, Warren County, Butler County, and Clermont County is particularly Republican. Ohio is a major producer of machines, tires and rubber products, steel, processed foods, tools, and other manufactured goods. This is not immediately obvious because Ohio specializes in capital goods (goods used to make other goods, like machine tools, automobile parts, industrial chemicals, and plastic moldings). Nevertheless, there are well known Ohio consumer items including some Procter & Gamble products, Smuckers jams and jellies, and Day-Glo paints. The airplane was invented in Ohio, as the outcome of brothers Wilbur and Orville Wright's experiments in Dayton. Commercial production of aircraft in the USA has left the state, but a large military experimental and design facility, Wright-Patterson Air Force Base located near Dayton, serves in the co-ordination of production of US military aircraft. Many of the Wright brothers' earliest aerodynamic experiments took place in what is now the military base, Wright Hill and Huffman Prairie. Ohio has many aerospace, defense, and NASA parts and systems suppliers scattered throughout the state as well. As part of the Corn Belt, agriculture also plays an important role in the state's economy. There is also a small commercial fishing sector on Lake Erie, and the principal catch is yellow perch. In addition, Ohio's historical attractions, varying landscapes, and recreational opportunities are the basis for a thriving tourist industry. Over 2,500 lakes and 43,000 miles (70,000 km) of river landscapes attract boaters, fishermen, and swimmers. Three major amusement parks, Cedar Point, Geauga Lake, and Kings Island, are also important to the tourism industry. Of special historical interest are the Native American archaeological sites—including burial mounds and other sites. The Bureau of Economic Analysis estimates that Ohio's gross state product in 2004 was $419 billion  Per capita personal income in 2003 was $30,129, 25th in the nation. Ohio's agricultural outputs include soybeans, dairy products, corn, tomatoes, hogs, cattle, poultry, and eggs. As of 2005, there were 76,500 farms in Ohio, covering over 14 million acres (56,656 km²). Its industrial outputs include transportation equipment, fabricated metal products, machinery, food processing, and electricity equipment. The largest companies in Ohio are in healthcare, grocery and food products, tire and rubber products, and insurance. Ohio is recognized for its health care, due to several flagship hospitals that operate in the northeast region of the state. The Cleveland Clinic, ranked among the three leading hospitals in the U.S., has its world headquarters and main campus in Cleveland. Its rival, the University Hospitals of Cleveland health system, includes the Rainbow Babies and Children's Hospital, ranks among the top ten children's hospitals in the country. Several major east-west transportation corridors go through Ohio. One of those pioneer routes, known in the early 1900s as "Ohio Market Route 3," was chosen in 1913 to become part of the historic Lincoln Highway which was the first road across America, connecting New York City to San Francisco. In Ohio, the Lincoln Highway linked many towns and cities together across the state and had a major impact on the developing of the state. With the implementation of the federal numbered highway system in 1926, the Lincoln Highway through Ohio became U.S. Highway 30. Ohio also is home to 228 miles of the Historic National Road. Ohio has a highly developed network of roads and interstate highways. Major east-west through routes include the Ohio Turnpike (I-80/I-90) in the north, I-76 through Akron to Pennsylvania, U.S. 30 (the Lincoln Highway) a bit further south through Canton, Mansfield, Lima, and Van Wert, I-70 through Columbus and Dayton, and the Appalachian Highway (Ohio 32) running from West Virginia to Cincinnati. Major north-south routes include I-75 in the west through Toledo, Dayton, and Cincinnati, I-71 through the middle of the state from Cleveland through Columbus and Cincinnati into Kentucky, and I-77 in the eastern part of the state from Cleveland through Akron, Canton, New Philadelphia and Marietta down into West Virginia. Interstate 75 between Cincinnati & Dayton is one of the heaviest section of traveled interstate in Ohio. Air travel includes Cleveland Hopkins International Airport, which is a major hub for Continental Airlines, as well as Cincinnati/Northern Kentucky International Airport (located in the state of Kentucky), which is a major hub for Delta Air Lines. Other major airports are located in Dayton, Columbus, and Akron-Canton. Ohio's system of public education is outlined in the state constitution's Article VI and Title XXXIII of the Ohio Revised Code. Ohio's system is substantially similar to other states'. Ohio has a Department of Education, a State Board of Education, and then nearly 700 districts that have their own boards of education and administrations. The Ohio Board of Regents governs and assists with Ohio's system of higher education, especially public colleges and universities. 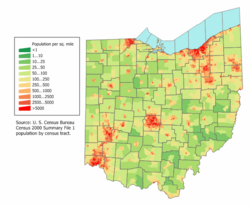 As of the 2006 census, Ohio had an estimated population of 11,478,006, an increase of 7,321 from the prior year and an increase of 124,861 since the year 2000. The largest ancestry groups in the state are German (25.2 percent), Irish (12.7 percent), African American (11.5 percent), English (9.2 percent), American (8.5 percent), and Italian (6.0 percent). German is the largest reported ancestry in most of the counties in Ohio, especially in the northwest. Ohioans who cited American and British ancestry are present throughout the state as well, particularly in the south-central part of the state. 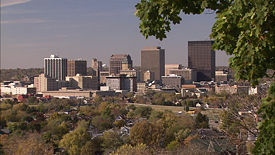 The cities of Cleveland, Cincinnati, and Dayton have large African-American communities. The cities of Cleveland and Toledo have sizable Hispanic populations, while the Cleveland and Columbus areas have the largest Asian populations. Greater Cleveland is home to a notably large Jewish community. More than 40 percent of the state's population is concentrated in the Lakeshore and Uplands region in the north and northeast part of the state. Four of the state's largest cities are located in that area. The Youngstown metropolitan area extends into Pennsylvania. which is the home of the state government and numerous education institutions. Approximately half of that city's work force are employed in government, education, finance, and other service occupations. Ohio's northwest section is primarily agricultural. The largest city in that section of the state is Lima, an industrial and market center. 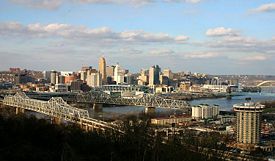 The Cincinnati metropolitan area extends into the states of Kentucky and Indiana. Fairborn, in the same region, is the home of Wright-Patterson Air Force Base, a major research center. ↑ Ohio Quick Facts. Ohio Historical Society. Retrieved February 17, 2012. ↑ City of Columbus: Fun Facts. City of Columbus, Ohio (2006). Retrieved February 17, 2012. 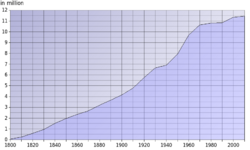 ↑ 5.0 5.1 Elevations and Distances in the United States. United States Geological Survey (2001). Retrieved October 24, 2011. ↑ Mary Stockwell, The Ohio Adventure (Layton, UT: Gibbs Smith, 2003, ISBN 978-1586853617), 88. ↑ Creation of the Board of Elections. Mahoning County Board of Elections. Retrieved February 17, 2012. ↑ The Governors of Ohio. Ohio Historical Society (January 8, 2007). Retrieved February 17, 2012. ↑ Sherrod Brown. Washington Post. Retrieved February 17, 20127. ↑ The Economist. December 20, 2005. A grain of sand for your thoughts Retrieved November 29, 2007. ↑ Cable News Network. Election Results Retrieved November 29, 2007. ↑ Clifford Woodruff. October 26, 2006. Gross Domestic Product (GDP) by State, 2005 Retrieved November 30, 2007. ↑ Ohio Historical Society. Ohio Quick Facts Retrieved November 30, 2007. Mithun, Marianne. 1999. Languages of Native North America. Cambridge: Cambridge University Press. Record Lowest Temperatures by State. NCDC. Retrieved November 21, 2007. Record Highest Temperatures by State. NCDC. Retrieved November 21, 2007. Annual Estimates of the Population for Incorporated Places in Ohio. Census.Gov. Retrieved November 21, 2007. Annual Estimates of the Population of Metropolitan and Micropolitan Statistical Areas. Census.Gov. Retrieved November 21, 2007. Population and Population Centers by State. Census.Gov. Retrieved November 21, 2007. This page was last modified on 18 December 2018, at 15:24.